(Nanowerk News) In the rational world of science, everything can be explained by cause and effect. Sometimes when the cause is known, the ensuing effects can be predicted. But more often scientists try to measure something that “should be there”, or else they discover new phenomena that have no apparent reason or cause. Indeed, most scientific research arises from these two starting points, working from opposite directions to connect cause with effect. Prof. Moty Heiblum of the Condensed Matter Physics Department and his research group recently conducted an experiment ("Robust Electron Pairing in the Integer Quantum Hall Effect Regime") looking for an effect that “should be there” and ended up with an unexplained phenomenon. Working in the Braun Center for Submicron Research, the group was experimenting with a phenomenon known as the quantum Hall effect. In this system, electrons flow in a two-dimensional plane and are exposed to a strong magnetic field perpendicular to the plane. The electrons, which “prefer” to run in straight lines, get pulled from their original paths by the magnetic field and end up traveling around the edges of the plane. But what Heiblum and his group observed in the electron flow seemed to belong to a different type of system: superconductivity. Electrons, which all carry negative charges, normally repel one another. However, under very special conditions, in some materials and at extremely low temperatures, electrons can actually “hook up” to form pairs called Cooper pairs. Cooper pairs can move through a material with no resistance whatsoever, and this state is thus known as superconductivity. An electron interferometer: Pairing of electrons takes place in the path denoted by the broken red line. So it came as a great surprise to discover electrons pairing up under certain conditions in their quantum Hall system – forming pairs that were remarkably similar to Cooper pairs. This is, indeed, the first time that this phenomenon has been observed outside of superconductivity, and the scientists are still not quite sure what to make of it. Once the electrons are pulled from their path by the magnetic field and forced to flow near the edges of the quantum Hall system, they travel in “parallel lanes” at varying distances from the edge. The scientists are now wondering if the close proximity of electrons moving in those parallel lanes could somehow cause electrons to “feel” one another more strongly and, consequently, interact in a different manner than the ubiquitous repulsion. The phenomenon was observed at the exit to the system. 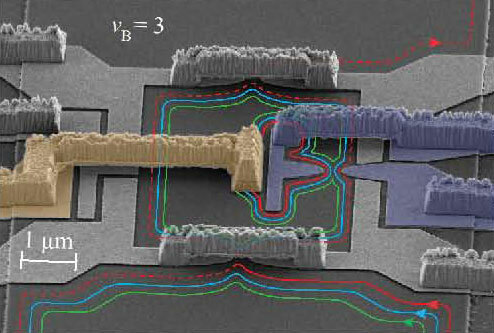 Electrons leaving the outer lane were measured; the surprise came when the exiting charges were found to be twice that of a normal, single electron. In other words, the current was carried by paired electrons, similar to that of Cooper pairs that flow so freely in the superconducting state. Although this phenomenon was completely unexpected and is still not understood, the question asked by the prophet Amos, with his insistence on rational cause and effect, resonates with the scientists: Why do these pairs of electrons “walk together,” apparently in total “agreement”? What causes the electrons in this system to form pairs? Or conversely, what is the effect of electron pairing on the functioning of the system? The Weizmann Institute scientists are already conducting new experiments to help sort out the riddle of the quantum Hall electron pairs.